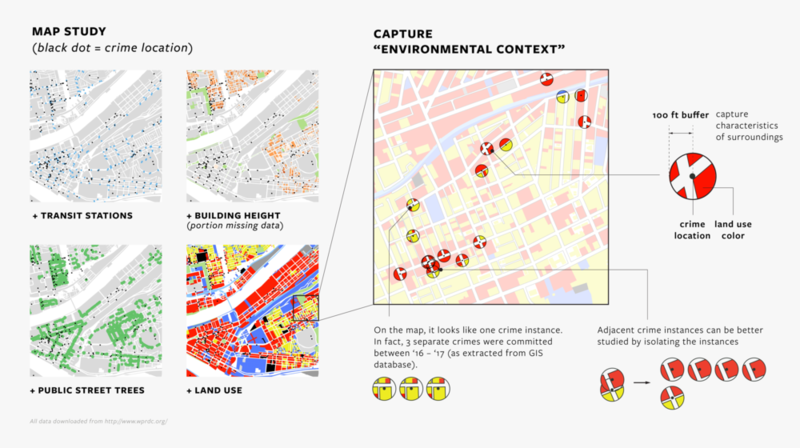 Visualizing relationships between criminal activities and urban design. This is an individual project. Create an interactive platform that allows users to discover the important relationships between sets of seemingly unrelated urban data. A web-based data visualization platform for planners to discover the covariant relationship between low-level crimes and urban design elements by neighborhood. 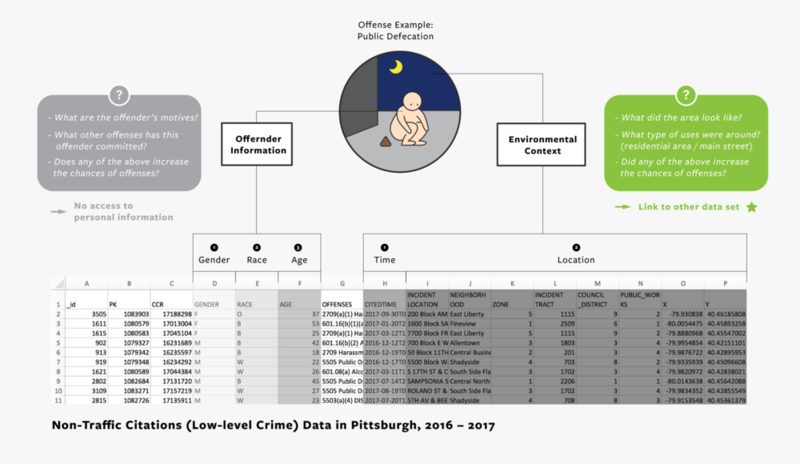 During the initial data exploration, I found low-level crime data interesting for its rich information on offenders but light on environmental context. Interested to see whether environmental characteristics also contribute to the advances of crime, I overlaid the crime data with other geo-referenced data. I started to discover a series of interesting patterns showing the locational context (in this case, land use) of crime instances. I also found that existing mapping convention reduce the significance of overlapping data points. In designing an experience to view this data,I developed two narrations and tested it on 10 classmates. I asked for feedbacks on readability and clarity – what is the story? where do you start get confused? what information do you need to proceed? After multiple testing on students, I realized that students' low engagement with the narratives is mostly because "land uses" does not directly resonate with their daily lives. 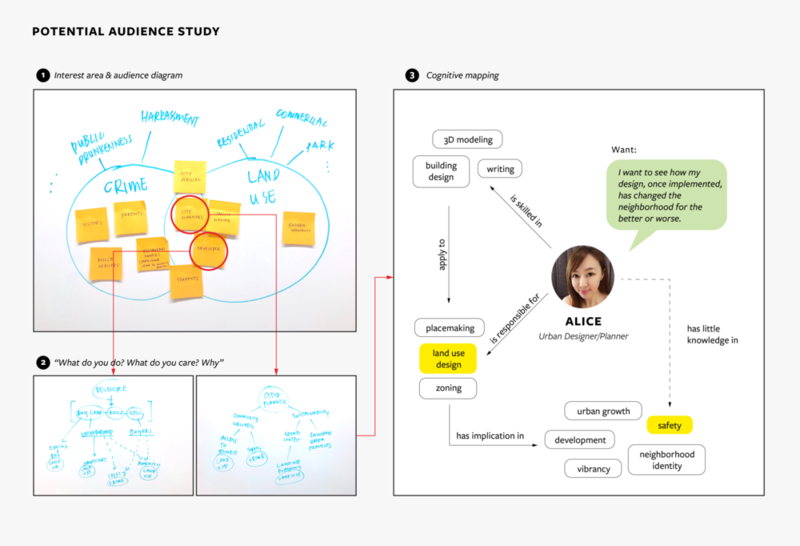 This realization urged me consider the potential audience of this data visualization tool in the design process to make the tool most relevant and the revealed knowledge applicable. After getting feedbacks and defining audience, I started building the full data visualization sequence. 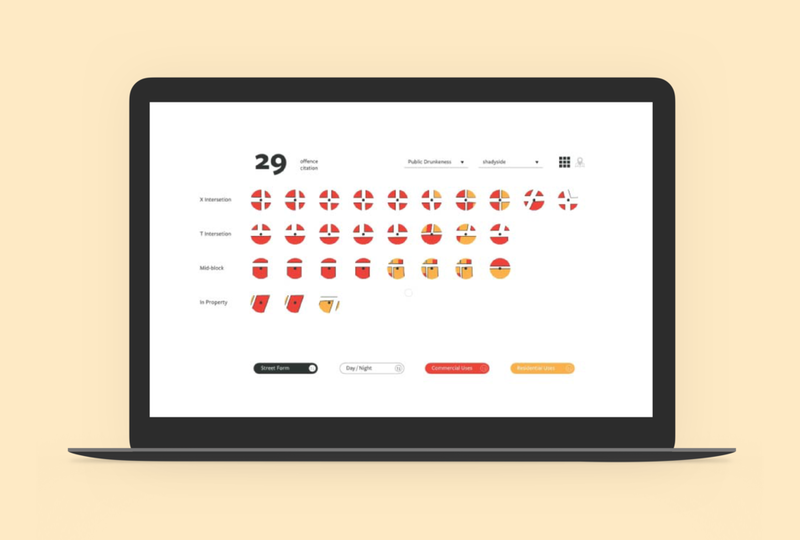 I was able to create three versions of clickable prototypes for usability testing. Due to time/resource constraints, these testing were done by classmates (design students), as supposed to the targeted audience. Between each iteration of prototype, I went through extensive studies on form, color, and position in both static and animated stages. One of the biggest challenges was the color metaphor for land uses – many users (design students) expressed confusion of color relevance (red: commercial; yellow/orange: residential), seeing red as "aggressive/warning" colors. However, considering the knowledge base of targeted audience, the color metaphor should be intuitive – they match the color standards for land use mapping in the planning industry. The final design was significantly improved from the early versions in terms of storytelling, visual design, clarity, and data features. The design started with giving user the context and provide options for users to choose their crime/neighborhood of interest. The main dashboard prominently features the total crime instance count and treats each crime instance as equal. The dashboard allows for toggling of multiple features (main panel), shifting view point (grid vs. map), and changing crime/neighborhood (secondary panel). The design is flexible, yet its presentation and visual hierarchy guide visitors through a main storyline. On the final demo day, I received many useful feedback from professors and classmates – mostly around data and features that could be added to support my targeted audience. For instance, the day/night information, together with dates, could potentially draw connection between special events (ex. Steeler's games) and certain crime type (ex. public drunkenness). Moving forward, I would bring this tool to the targeted users – planners and local activist groups – and get their feedback on the usefulness of this tool and iterate from there.